October 20, 2014: Did You Ever Go Steady? Hey Therese ,,, oh cool it's that time again ,,, ( lines up for single file .."
Hi everyone! It's Singles Going Steady week! ..and you are first in "line" in the single file .. indeed Therese yea ! I have a copy of this 7-inch. Joan Jett on the flip side. always i listen to freeform music while i make freeform food! it's good for the food!!!!!!!!! I dare you to play a whole 7" at the wrong speed. I 33 1/3x dare you! Hi Therese. I could listen to that Status Quo track followed by this Donovan over and over all week. man, great stuff. I'm excited for singes goin' steady week! have a goodnight. We have been making homemade artisan fresh corzetti right now! we are making coraetti right now! what are your favorite flours?! i am conducting a study!! I'm trying to think of musicians that have held a significant public office. Sonny Bono and Peter Garrett are the two I immediately think of. @BGZ - We can't count saxophone player Bill Clinton, can we? The sax was just a hobby for him. Greg Dulli and I share a birthday. If I'd been born a day later I'd have shared a birthday with Katherine Hepburn. I would have preferred that. @Ken: I was using the criteria of persons that were professional musicians. Musician politicians are alright if you like saxophones. BLERG! Please forgive me for misspelling Katharine Hepburn's first name. Some internet search turned up John Hall, who was in Orleans and served in Congress from 2007 to 2011. Skips are just analog mp3 glitches. such an original cover, Big Star! What would "singles" be without that "ambiance"? Triangular, octagonal, amoeba-shaped- -whatever . HEY Therese! Nice to see SGS off to a kickin' start in your capable hands. Moving all that equipment is not an easy task. Talkin' to yourself like you're Matthew McConaughey drivin' around in a Lincoln. If the equipment isn't needed every day, why not check out Rent-A-Center? ...guess Therese's cat isn't a Jandek fan. Now that's a well-raised kitty. I want to see more non-cat mascot nominees!!! Triangular record to glow-in-the-dark record. There was a version of this RFTC single that came with pogs. I just realized... Nobody who listens to WFMU owns a ferret? Or a cow. I keep waiting for somebody to post a MU cow. What about ferrets that listen to WFMU that don't own any people? Maybe ferret fanciers just tend to be very private about their hobby? Are ferrets still illegal in New York City? P-90 I may have stolen your Plasmatics disc. Theresse, I think the Bloomberg made them legal when he left office. Undoing Giuliani's hatred. Or maybe DiBlasio did it? I know that I heard something recently about it. I meant t say if someone had a dog and a cow, please share that pic! Yes, ferrets are still contraband, but Big Bill DeBlasio has announced he's considering a change in ferret policy. Hello Therese, do you have any Hum? if a request is bad form, i apologize. Donald Trump owns a ferret; it's perched atop his head. Dog and cow would win for sure. Hi Cory- requests aren't bad form, but I don't have any Hum. Sorry! At least Chris Christie allows WEASELS in New Jersey! Hah! See what I did! Therese, SGS week is off to a great start! @rw: "Where have you gone, Wendy O-O-O? A nation turns its lonely eyes to you..."
BadGuyZero, just want check... You don't have Ebola, right? Good song, but Linda's contribution really MAKES it. OK, uber-cheap shot. It's late. I do not have ebola. A few days ago I thought of a shirt I want to wear next time I fly. 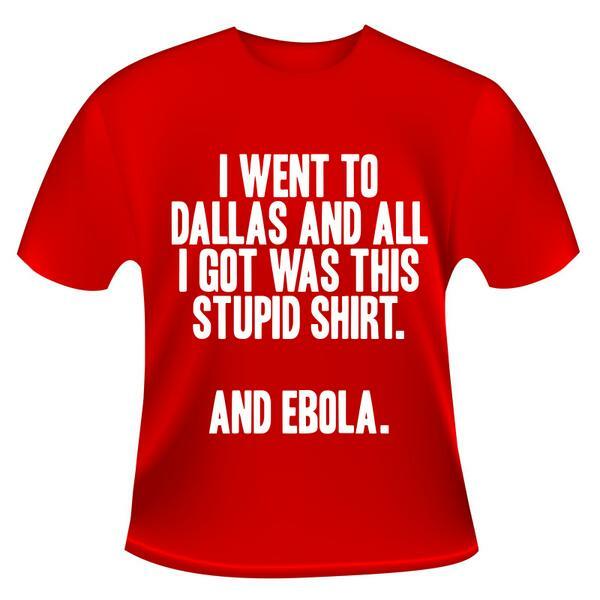 What about a t-shirt that just says "Ebola" on block letters? Pogs were like marbles...but paper. Pogs had a "slammer" pog that you with throw on top of a stack of pogs and then they fall and something happens. You said that thing about marbles just as I hit post. I don't know how much the stream is delayed. What I'm trying to say is that it's not a true "jinx" situation, although I would gladly buy you a soda at your request. I gave out Universal Monsters pogs instead of candy one year [1995???]. Therese, groovy. thanks for the info. i'll have to see if i can gift you kittens some hum. Even coffee and soul singles can't keep me from fading.... Good night all! Thanks Therese! Have you played your three records at the wrong speed yet? You've only got 20 min. left! I can't wait for Rob and Paloma's Syl Johnson documentary. Great tunes as always, Therese! Have a great week everyone. See you back here next time. Have a steady week, Therese. I'm always late to these playlists, but I love what you've been doing for your sets lately, Therese. Absolute aces.